The Compass Table Top is one of the most unique display stands to come around in a long time, Compass is truly special. Four practical rectangle graphic sizes are mounted to a variable height telescoping mast. The banner-to-mast mount is an innovative hub that allows the banner to rotate at different angles as well as tilt up or down. 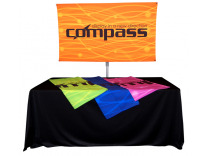 It’s very easy to use and aggressively priced making the Compass table top display, an incredible value. Versatile and unique, no other table top combines tilt/rotate to create dynamic back walls, serve as a table top header (behind the table) and is perfect for floor-standing product back walls ... Compass does it all!